You all know him, you’ve all heard his songs and can even sing along with his bog ones. So there is no sense in denying it but you all Love Weird Al! Alpocalypse, his thirteenth album, launched on Monday and many eyes (er ears) were focused on what would be the follow-up to his insanely successful (and career high) Straight Outta Lynwood. So far it hasn’t disappointed. Before I can go any further with my review I have to admit two things. 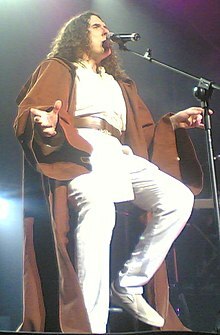 1) I love weird Al and have met him in person. 2) I am insanely bias. That being said on with the review. My overall rating of this CD is based on a simple fact. Did you purchase the online-only EP Internet Leaks? So back to the review at hand. 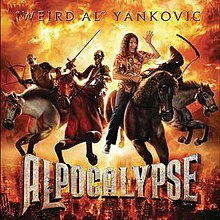 If you were like me and bought the EP you are going to find yourself slightly disappointed as 5 of the 13 songs on Alpocalypse are from the Internet Leaks EP. That being said the CD is still exceptionally good. The lead song is ‘Perform this Way’ a parody of Lady Gaga’s Born this way. The other bew parodies are TMZ (“You Belong to Me by Taylor Swift), a song that takes crack equally between TMZ and the celebrities they report on; Another Tattoo (Nothing on You by B.o.B.) a song about tattoo addiction, and Party in the CIA (Party in the USA by Miley Cyrus). he new original songs are ‘Stop Forwarding That Crap To Me’ and his faux-ballad (fallad?) ‘If That isn’t Love.’ Then there is the polka, Polka Face (clever). He uses Gaga, Owl City, Britney Spears, and Kid Cuddy just to mention a few. So aside from the re-releases of the Internet-Five I still highly suggest this album to anybody who is a Weird Al fan from any generation. It has enough of the new-Al appeal (Rap and major songs parodies) and lots of the classic-Al (The weird songs). His usual humour comes across brilliantly and the lyrics are better than most ‘mainstream’ or ‘straight’ albums out there. If you didn’t by Internet Leaks then you will find this AMAZING!!!! CNR. A song about Charles Nelson Reilly (Guy from the Match Game) doing Chuck Norris style feats. It’s a great song with a nice beat and great lyrics. Craiglist. A Doors styled song about the inner workings, and weirdness, of…well…Craiglist. Ringtone. The Queen portion of the CD touches on those embarrassing and horrific. Whatever you Like: The T.I. parody that shows how to provide for you woman, the only difference between the original is Wierd Al’s is less….gansta. Skipper Dan. A Weezer style song about greatest actor in all of time and space who never got that big break and now works at Disneyland on the Jugle Cruise line. Without Internet Leaks this CD is BEYOND AMAZING!!! One of his best in past years. This entry was posted in 42 Screens and tagged alpocalypse, geek, music, parody, weird al. Bookmark the permalink.